Westminster-Canterbury on Chesapeake Bay in Virginia Beach, VA, won Dignity Gold in the McKnight’s Excellence in Technology Awards (Skilled). Seniors with cognitive impairment are at risk for isolation and depression. But Westminster-Canterbury on Chesapeake Bay in Virginia Beach, VA, used innovative bedside technology to boost engagement, allowing it to land the Gold Award in the Dignity category of McKnight’s Excellence in Technology Awards (Skilled). The community launched a clinical trial through the Birdsong Initiative to find if digital engagement helped residents’ moods. It did, with results that included a 55% decrease in depression. Participants had an overall 7% decrease in blood pressure. That cost is less than discounted in-house cable tv, he told McKnight’s. The Birdsong Software costs have been reduced to $7 per month per unit to about $18 per month per unit depending on the number of units purchased. “We put it in one hundred percent of our rooms and people love it,” Unkle said. One resident, Karla, had cognitive decline that progressed to the point she was nonverbal. “Through these tablets and engagement her interest in life was reawakened,” he said. -Saint Agnes Urgent Care in Fresno, CA, for its use of wall boards to list medical conditions. -Avamere Rehabilitation of Eugene for creating a sleep program that increased cognition (BIMS score), decreased depression, increased satisfaction, decreased wounds and reduced the use of sleep aids. -Cantex Continuing Care Network in Texas won Gold for its use of the NexusConnexions. “Through NexusConnexions reports, Cantex can demonstrate to its referral sources the total post-discharge readmissions prevented through interventions performed through its transitional care efforts,” the application states. -Illuminate HC in Illinois won silver for its use of tablets and new alerts. This includes a digital door tablet that can be mounted outside a resident room, a “Your Day, Your Way” scheduling app that lets residents schedule activities, and discreet alert options for staff to request immediate assistance. -Signature HealthCARE of Norfolk won bronze for its use of 2nomi to create a biographical photo book of the resident’s life story. The book is used in care planning. 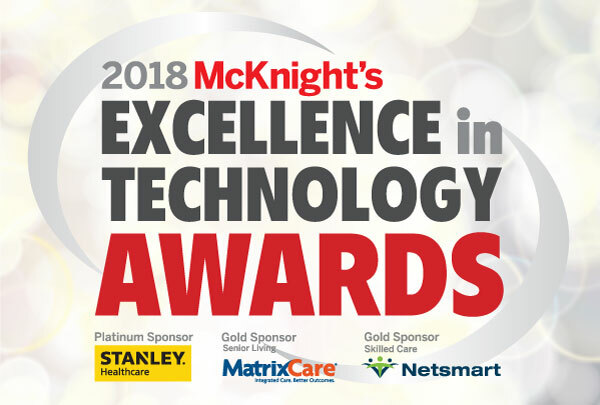 The McKnight’s Tech Awards winners will be announced every day this week, both for Skilled Nursing in the McKnight’s Daily Update and in Senior Care on McKnightsSeniorLiving.com. Stanley Healthcare is this year’s Platinum Sponsor, with Gold-level support from Netsmart and MatrixCare.